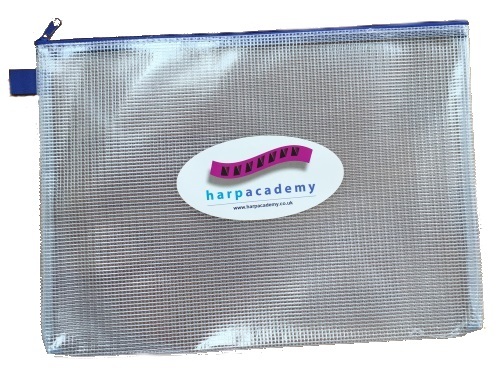 This is the essential piece of kit for all Harp Academy students. It’s where we record your mission at the end of each lesson and students must bring it along each week. If a Music Diary is lost or completed, a new one should be ordered to ensure continuity of learning. 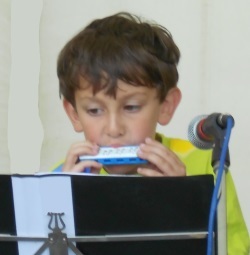 Your Music Diary gives essential information regarding our behaviour for lessons, practise tips and guide to registering on the Harp Academy website. There is also space for song composition and music games for rainy days, such as Word Search. Music Diaries are a vital link between Harp Academy and parents. This is where parents can check their child’s progress and add their own message for their Harp Academy teacher. Our clear mesh, A4 music folders are perfect for keeping music sheets, diaries and harmonicas together safely. Mesh folders are extra-strong, zip-fastened, highly durable and also water-resistant. If they’re good enough for motor cycle couriers and round the world yachtsmen, they’re ideal for us! Our clear white lanyards are ideal for attaching to 4 hole Speedy harmonicas to prevent them from being dropped. Clear white in colour, and bearing the Harp Academy logo and website address, each lanyard also has an in-built, black safety break. 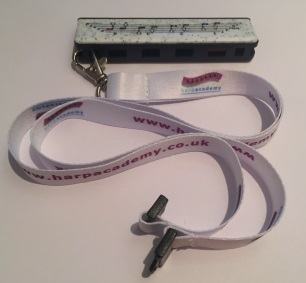 A lanyard is normally provided as part of our free taster session kit, along with a 4 hole starter harmonica. New and replacement lanyards can be ordered here.